When people say they want to become more like Jesus, they usually mean they want to become a moral person. Such morality is often defined by religious values shaped by a modern Christian subculture—not all of which is bad. My suspicion, though, is that if we look closely at Jesus without our modern moralistic filter, fewer people would want to become more like Jesus. Jesus was an unmarried peasant who didn’t put his “family first.” All of his followers were mothers and brothers and sisters and children. Most of his friends were criminals or living sinful lifestyles. Jesus had hardly any friends who would be considered “religious.” He spent most of his time with drunks, gluttons, fornicators, and thieves. He was so close to “sinners” that the religious leaders thought he was one. And nearly everything Jesus said and did made religious people mad. Jesus was executed by the state for treason, and his followers, who took his words seriously, were seen as a threat—not a friend—to the political powers to be. The similarities between Roman values and American values are striking. Yet so is the American church’s unchecked adoption of such Roman (and American) values. Our addiction to comfort and security and material possessions that we stuff into our bulging barns mirrors the pax Romana but is a far cry from the peace of Christ which includes simplicity, suffering, and death. One of Jesus’s favorite topics had to do with money. And this got people really riled up. “Sell your possessions, and give to the needy” (Luke 12:33). “Any one of you who does not renounce all that he has cannot be my disciple” (Luke 14:33). He told a wealthy and moral leader to “sell all that you have and distribute to the poor, and you will have treasure I heaven; and come, follow me” (Luke 18:22). In his first—and foundational—sermon, Jesus said he has been “anointed…to proclaim good news to the poor” (Luke 4:18). Not poor in Spirit but actual poor people (cf. Luke 6:20). In Matthew 25, one of the most terrifying passages in the Bible, Jesus describes judgment day in detail and His criterion for who’s in and who’s out has to do with whether you and I have served the poor and needy in this life (25:31-46). Are you serving the poor and needy? If Jesus means what He says in Matthew 25, will you receive a positive or negative verdict on judgment day? Some people say that what Jesus really means is that we are saved by grace through faith and whether we serve the poor is largely irrelevant for God’s verdict on judgment day. The classic evangelistic line, “If you were to die today and God were to ask you, ‘why should I let you into my kingdom?’ what would you say?” The expected right answer is usually limited to right belief (Jesus) divorced from the right behavior that follows that belief (serving the poor). According to Matthew 25, part of what you should say—indeed, what we all need to say—is “I served the least of these.” Part of what it means to become more like (the biblical) Jesus is becoming excessively generous with our material wealth and having the scent of poverty on our hands and feet. Jesus also talked a lot about love. “This is my commandment, that you love one another as I have loved you” (John 15:12) and “Greater love has no one than this, that someone lay down his life for his friends” (John 15:13). When most people think of Jesus, they think of love. And they’re right to do so. And Jesus didn’t just talk about it. He lived it. He love touched lepers, embraced sinners, healed the sick, and extended forgiveness to adulterers seconds after they sinned. It is love—unconditional, agape love—that binds believers together, and knits us to the heart of our triune God (John 17:26). Jesus breaks new ground by going beyond what Leviticus says about loving your neighbor as yourself (Lev 19:18). He extends love to include one’s enemies (Matt 5:44-45). Take a quick look at the early Church and you’ll see that enemy-love would become the hallmark of Christianity long after Jesus’s resurrection. When people thought of Christians, they recognized them as the people who, like Jesus, love their enemies. rabbis of his day. Celibacy is praised, divorce is ruled out except for fornication, and gazing on a woman is akin to adultery. Jesus’s deep friendship with sinners doesn’t change the fact that his sermon on the mount (Matt 5-7) still stands as one of the strictest ethical speeches in all of religious history, making even Moses look like he was soft on sin. If a one of the Na’vi left planet Pandora and visited earth, would they notice a peculiar people? Would they recognize a sub-section of humanity that’s marked by self-denial, enemy-love, and a counter-cultural sexual ethic? Or would we blend into the sea of those who are “lovers of self, lovers of money…lovers of pleasure rather than lovers of God” (1 Tim 3)? 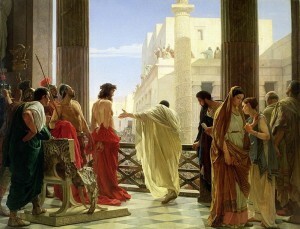 Jesus looked very different than the religious and political majority culture. Do we? What Does it Mean to Be "Called?" In my last post, I argued that the ever popular Christianese phrase “feeling called to…” is not a biblical concept. When used theologically, the word “call/calling” is almost exclusively used in terms of election unto salvation, not to authenticate a spiritual nudge we may have toward a particular ministry or vocation. I’m writing a book on discipleship that’s tentatively titled “The State of Discipleship in the Church.” (I'm sure I'll find a much sexier title than that, but it's what we've got for now.) So I’ve been knee-deep in all the discipleship books and statistical surveys as I try to get my arms and heart around the topic. Defining discipleship can be tricky. We say we want to “become more like Jesus” but we interpret Jesus through a cultural lens of American Christian values. What the Bleep Does the Bible Say About Profanity? But religious people have been covering up obscene language in the Bible for years. Jewish scribes in the middle ages, who copied the Hebrew Old Testament used as the base for all English translations, edited out some vulgar words and replaced them with nicer ones. For instance, God originally prophesied through Zechariah that women in Israel would be raped by wicked, invading armies. The word God inspired is shagel, and according to Hebrew linguists, shagel is an obscene word that describes a sexual act.